There’s no debate that Wisconsin is extraordinarily rich in water resources. There’s no debate that our surface waters are fundamentally connected to our groundwater, and that overuse of the latter can have unintended consequences on the quantity and quality of the former. There’s no debate that Wisconsin is in need of a comprehensive strategy to balance the important uses of groundwater with long term protection of all our water assets. But unfortunately, there won’t be any debate at all in the Wisconsin Senate’s Labor and Regulatory Reform Committee on SB76, a bill that takes the state further away from that comprehensive strategy. That’s because when the committee votes on the bill on March 28 they’ll do so using a “paper ballot” process, where only an “up or down” vote on the bill is allowed, and no debate takes place – the committee doesn’t even hold an actual meeting. SB76 (and its Assembly companion AB105) were subjected to a nine hour hearing earlier in March, where both those opposed and for the bill respectfully (but passionately) brought forth their opinions, often peppered with questions from legislators on both sides of the aisle. 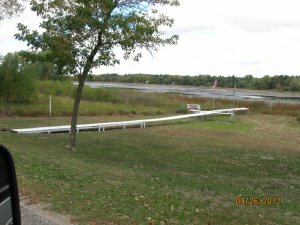 Substantively, the bill prohibits review of high capacity well permits when a well is being repaired, reconstructed, replaced, or transferred, and calls for a study of select parts of central Wisconsin where a massive increase in pumping has led to lowered water levels in many lakes and streams. In so doing, it removes any point in time where the Department of Natural Resources would review high cap well permits, arguably allowing well owners to pump under the terms of the permit perpetually, regardless of the well’s impact to surrounding surface waters or other wells. Wisconsin Lakes, while opposed to the bill as written, expressed an understanding that there is a need to know that wells could keep pumping when repaired, reconstructed, replaced, or transferred is important to agricultural interests especially, as that certainty helps in getting loans for operations, estate planning, etc. But we argued that Wisconsin gives up too much by just providing that certainty, and should instead either enact a truly comprehensive solution to groundwater management, or at a minimum set some sort of periodic review for high capacity well permits. The bill, substantially similar to one debated last year that ultimately failed to pass, was in front of two different committees than it was in 2016, and many of the committee members seemed genuinely interested in gaining a deeper understanding of the issue. But, at least in the Senate committee, there will be no further public debate because of the decision of Sen. Stephen Nass (R-Whitewater), the committee chairperson, to use the paper ballot process for the committee’s vote. On March 28 the senators on the committee will have from between 10am and 1pm to decide on the measure from the comfort of their offices, mark their ballot, and turn in their vote. While this process does at least preserve public record of how each senator votes, it prevents an opportunity for debate or amendment of a fixable bill. That’s unfortunate, and not the sort of process we need to decide questions that will impact the future of Wisconsin’s water. Wisconsin Lakes is therefore calling on the members of the Senate Committee for Labor and Regulatory Reform to reject SB76, until it is amended to include a reasonable period of periodic review, and certainly not allow it to proceed to the full Senate without the vigorous committee debate it deserves. You can always find info on bills, committee schedules, and who your legislators are at http://legis.wisconsin.gov/.